OK, this time I’m just resorting to the rainbows as an apology! I’m sorry for having such a sparse February. Hopefully March will be a little better… I hope you like this gown, I’m afraid it looked better in my head, so I was a little down about it, but as Brian says, “they can’t see into your head, so it’s OK!” For which we are all very grateful, I am sure. By the way, in 2009 I watched the red carpet for that year’s Oscars and drew three of the gowns – “livedolling,” I called it. I didn’t do it last year, but I’m going to do it this year! (It’ll be especially nice now that I have a scanner that doesn’t scan everything with those bands…) So join me on the evening of the 27th for all the great gowns. If any of you other paperdoll bloggers want to join me, too, that’d be a lot of fun! It’s so pretty! I loved the first rainbow dress you posted, and loved the second one more than that, but I love this one even more than the second! Also, you inspired me to make a paperdoll for my NaNoWriMo novel in November. ( http://alicorne137.deviantart.com/#/d399zt0 ) Took me forever to finish all of the outfits. I can’t imagine keeping up with something like this on a regular basis. You’re awesome! and i thought nothing could be more beautiful then the dress that came before this one.. Anyway, I really like your rainbow-collection! It is really pretty! You are amazing! The last dresses with the deep black colour and the rainbow colours were really great, and it was just as good with white! 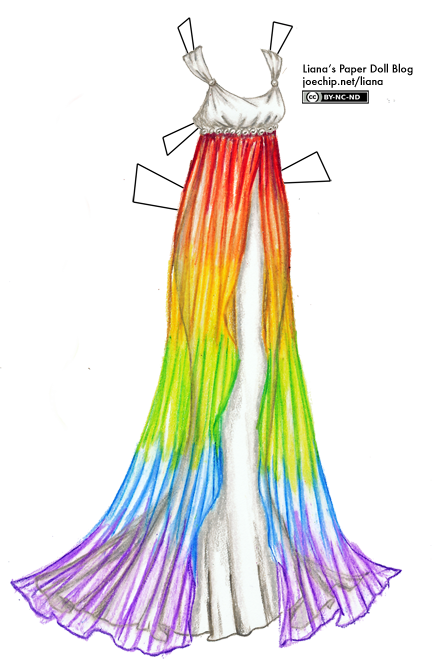 Definitely a rainbow fairy dress… This reminds me of some of the mermaid monday dresses you used to do. Lovely!! so glad to see you are back :) Again another beautiful rainbow dress! Can’t wait for your Oscar dresses, I loved the ones you did before. How many dresses do you think you will do this year? Ooooh my, but it is a pretty one :D The whimsical/historical-ish style of the dress itself is also really nice! Huhhhh… live dress-watching/drawing does sound fun. I haven’t got a TV though. Well, I’ll definitely watch for your drawings, whether or not I try drawing my own! YAY!! your back!!!! This dress is so sweet!! What a lovely, floaty, delicate dress! So different an interpretation of the “rainbow dress” idea–each so special yet each different! Thank you! I agree with all the compliments above! PS–Brian’s remark is so funny and so true! I really LOVE this one!!!!! Ur going 2 be livedolling this year? YES!!!! The rainbow kick continues. And I love it. I’m even reading a book called Black Rainbow. It would be a perfect dress for the goddess Iris. We missed you, Liana! And the rainbow tribute…we thank you from the bottom of our hearts. It’s very spring-y, a refreshing change from the dull turtlenecks I’ve gotten used to. But maybe I’ll watch the Oscars for the first time just to see the dresses and your posts! I don’t have a TV either – what I’ve done in the past is just keep refreshing the Oscars pictures on gettyimages. It’s not the most elegant solution, and if anyone has a better one, I’d be glad to hear it! It’s amazing! I love it! what would be the measurements if the dress were to be created? like pattern.